Can be cut for shipping. Double curtain rods by Kirsch. Clearance 2 inches. 2 1/2 inch continental in front, regular window curtain rod behind. Curtain hardware rods by Kirsch. Double drapery rods. Spring tension for easy installation.You can order one, or get a price break by ordering 4. This is a spring pressure 2 1/2" wide, white finish curtain rod. For Studio Coordinates decorative curtain rod pole. HD27118D: Fluted decorative curtain rods ring slides 100"-180"
Custom sized to your specifications. White finish extruded aluminum. Set includes assembled rod, wall or ceiling brackets and baton. Base price for first 3 feet. 94005 track, pinch pleat cubicle ripplefold. One way 16' maximum, 32 pounds maximum, two way, 32' maximum, 64 pound maximum. Hospital bed curtain track and more. Sizes over 94 inches will have an oversize freight charge manually added. Notification of amount will be emailed for approval before shipping. First 3 feet included in base price. Plus truck freight over 104". Steel curtain rod with a white finish. White finish. Order in 12 foot increments. Baton draw, ceiling or wall mount. For pinch pleat or Ripplefold systems. Architrac 94008 has headings for pinch pleat, cubicle and ripplefold draperies. Triple layer curtain treatments can be installed with these triple curtain rod sets. Use a combination of valance over privacy over sheer or other combinations you may dream up. Use double curtain rods for sheer treatment in back of a privacy treatment, or any curtain with a valance over it for style. Installation brackets are furnished with most curtain rod sets. Includes everything you need to motorize your existing shade, or your own fabric. Soness LT28 30 low voltage electric motor. Power cord and transformer included. Just add your fabric, install the hardware and plug it in. Limits will have to be set for up and down stops with included instructions. Maximum size: 96" x 96". Minimum 20 each. Wood bracket for 1 3/8 inch wood pole. Color selection matches the Wood Trends Classics collection. Two way draw, includes 2 support brackets and 30 slides for attaching your curtains. Curtain rod hardware for the budget minded. Empire Traverse Rods are made from heavy guage steel with a baked enamel finish. Quick mounting drop in brackets and supports that fit over rod are included. Cord guide is included to hold cord to wall. The Empire rod has self lubricating pulleys and slides.Polyester cor and continuous lacing for use at either end or to convert to one way draw. 2 inch decorative wood curtain rod rings for 2 inch Wood Trends Renaissance wood Curtain rods. Sold by bag containing four rings. By Kirsch. Last week of Super Sale! Order in 16 foot increments. Baton draw, ceiling or wall mount. For pinch pleat or Ripplefold systems. for wide windows. Comes in three pieces. A commitment to quality. Sizes over 94 inches will have an oversize freight charge manually added. Notification of amount will be emailed for approval before shipping. Window drapery rods by Graber. Graber super heavy duty features include a universal front loading end bracket, metal adjustable and reversible master carriers ball bearing end pulleys, a spring loaded side gate for adding or removing slides, molded, canted slides, can be converted to one way draw, scored center support base for easy mounting on narrow casings, universal cam lock stirrup, braided polyester cord, and angled tip on overlap arm. Use with tab top curtains, tie top curtains, eyelet curtains or pinch pleat draperies. The wrought iron collection by Kirsch is designed for single and double curtain treatments. Good for kids curtain rods. It also works nicely for corner curtain treatments using the swivel socket to connect the curtain rods in the corners. Even bay window can use this elegant solution. Single and double brackets, holdbacks, rings, finials and a stoutly made 1" rod dazzle in five finishes: Black curtain rods, Rust, Iron Oxide, Iron Gold, and Antique Pewter. Need extra brackets for your Kirsch Superfine traverse rod? Brackets, supports, slides and draw cord can be replaced on existing traverse rods. Many parts available at BasicQ. 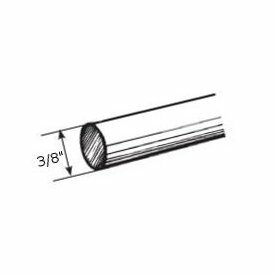 3315-025: Double curtain bracket bulk returns 5 1/26 1/2"
50960: Finial glass-nickel for estate ultra 2" decorative traverse rod. Wood drapery poles for your windows. Kirsch's reputation for quality and elegance was built on Wood Trends. These classic styles in rich colors and subtle grains complement wood furniture finishes and architectural details, allowing for a totally original design statement. With a wide assortment of components such as elbow brackets, swivel sockets and holdbacks, Wood Trends is not only timely but also functional. Lockseam, single rod. You can use side sections for corner curtain rod. Sides 18" to 42", Center 36" to 63". This is a basic rod for bay windows for a single application. It can be used for corner windows by omitting the center section. Clearance 2 inches. Basic bay window drapery rods by Kirsch.. See more solutions for corner and bay windows below. This curtain rod requires wall mount surface. The two outside sections can be used for corner windows. Lockseam, single corner curtain rod set. Each side extends from 18 to 46 inches and connects in the corner on a special bracket. Finished in white. 2 each 17" extensions for as small as 18"
Kirsch Architrac Curtain Rods for wide windows and more. Minimum 14 foot increments. White finish. Baton draw, ceiling mount. For pinch pleat or Ripplefold systems. Submit freight form for freight quote over 1 curtain rod. Quote will be emailed for approval. Brass finish. Clearance 1/2 inch.French door curtain rod. p585-054: 7/16" sash rod 48"-86"
Stainless steel and aluminum contemporary curtain rods. Stainless steel H-rail tube curtain rods up to 19 feet long without a splice. Use for hand drawn traversing system. German engineering by Busche since 1872. Available in lengths up to 20 feet. For long drapery rods wider than 20 feet, you can use splice #94110 to extend as long as necessary. Minimum 12 feet. Baton draw, ceiling or wall mount. For pinch pleat or Ripplefold systems. Use to attach a curtain rod baton to the master carrier. Base price is for first 3 feet. Set. Includes assemble rod, standard wall 93139 or ceiling 93138 brackest and 9923 cord tension pulley. Uses 93001 rod. Rod may be bent or curved at additional cost. Works well for corner curtain rod installations. Sizes over 94 inches will have an oversize freight charge manually added. Notification of amount will be emailed for approval before shipping. Architects, interior designers and construction specifiers whose reputations ride on the products they recommend choose Kirsch. The pioneer of custom Architrac and industry leading drapery heading systems. Recognized for precisely engineered products that perform under demanding commercial, institutional and residential environments, Architrac provides a complete selection of custom hardware systems ready to install or adaptable to satisfy virtually any installation. Plus truck freight over 104".